That's me . 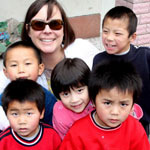 . . a Christ-loving, adoption and orphan advocating, husband loving, working-from-home Mom to Kelsey, Emily & Katie Mei. Read me my story again!! "Read me my story, again! Pleeeeeeeeease!" What exactly is her story, her book, you might be asking? It's her Lifebook, aptly entitled "Becoming Katie Mei." I know, I know . . . now you are asking what exactly is a Lifebook, right? A Lifebook is the "story" of your adopted child's life, from birth on. It's an opportunity to teach your child that every minute of their life has value and purpose, and even though their story includes loss, it also includes gain, redemption, and purpose. I had always intended to create a Lifebook for Katie, but always got stuck on the wording, choosing the right pictures, making sure it looked just so. Somehow I always got sidetracked and never completed her book. But when Katie went to Preschool last year it became very clear, very quickly, that she needed to understand her story better and we needed a way to present her story to curious classmates. We've always been good at talking to Katie about her beginnings in China, but somehow a 4 year old explaining the complicated and amazing process of adoption to another 4 year old just wasn't working. These days Katie's Lifebook can be found by her bed, on the coffee table, sitting on the bookshelf or laying on the floor. It's beautiful. It's meaningful. It has nice words and pretty pictures. But more than being nice to look at, Katie's Lifebook is meant to be read. Over and over and over. It's meant to honor her beginnings and the country from which she has come. It's meant to show her that God created her in her birthmother's womb and that He always has and always will have a plan for her life. It's meant to show her that our family loves her very, very much and we will always be her Forever Family. Really, it doesn't matter if she's headed to bed early or late. If that ridiculously cute little girl calls out, "Read me my story again . . . pleeeeeeeease," we will answer her request . . . every.single.time. Until they know Jesus . . . This is a Flickr badge showing public photos and videos from kfirstbrook. Make your own badge here.